No threat of subsidence faces the “Cube of Zoroaster”, which is a famed ancient quadrangular structure in southern Iran, according to a new research. Locally known as Ka’be-ye Zartosht, the 'cube' is one of monuments that stand in Naqsh-e Rostam, an archaeological cemetery near UNESCO-registered Persepolis. “The preliminary results of a data analysis indicate that the splendid monument stands strong, and so far, no subsidence-related issues have been found,” ILNA quoted Hamid Fadaei, director of the World Heritage site, as saying on Tuesday. A lengthened drought period in the region along with excessive use of groundwater are among reasons that ancient site may be threatened by subsidence, the report said. The limestone structure distances 46 metres from the mountain side, situated exactly opposite Darius II’s mausoleum. It is rectangular shaped and has only one entrance door and is made of white limestone. Naqsh-e Rostam, meaning “Picture of Rostam”, incorporates memorials of the Elamites, the Achaemenids and the Sassanians. It is where four Persian Achaemenid kings are laid to rest, those of Darius II, Artaxerxes I, Darius I and Xerxes I (from left to right facing the cliff), although some historians are still debating this. There are bas-relief carvings above the tomb chambers that are similar to those in Persepolis, with the kings standing on thrones supported by figures representing the subject nations below. 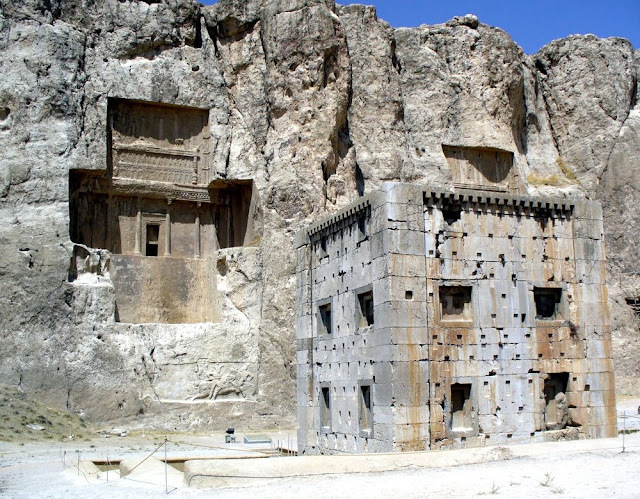 Beneath the funerary chambers are dotted with seven Sassanian era (224–651) bas-reliefs cut into the cliff depict vivid scenes of imperial conquests and royal ceremonies.